Having started off in Auckland, we headed out of the city in our snazzy little car. Our first stop was not far at all: Auckland Botanic Gardens. We were pointed in the direction of the African plants and the rose garden, which were particularly good this time of year. It’s odd to have arrived in rose season, having already left summer behind and entered winter when I left the UK just last week. 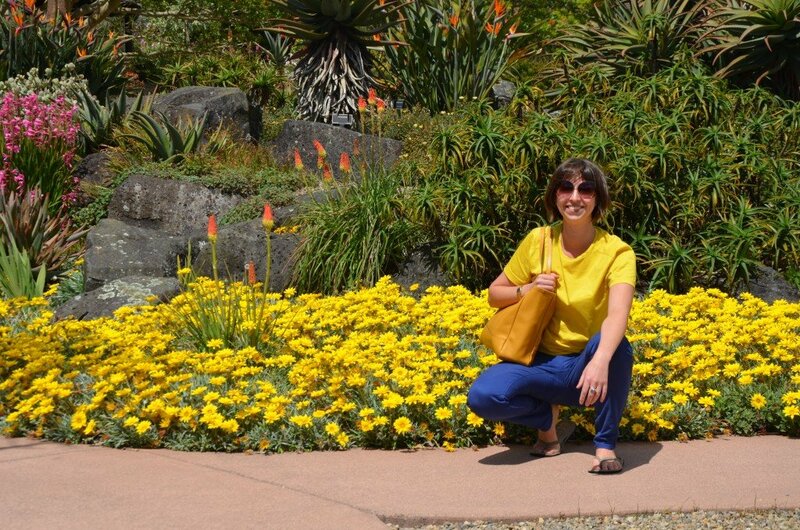 Annie at the Botanic Gardens, fortuitously coordinated with the African plants display. We stayed two nights in Thames, a small gold mining town at the bottom left corner of the Coromandel – about an hour and a half drive from Auckland. Our accommodation was in the Old Police Station, in the cellblock to be exact. 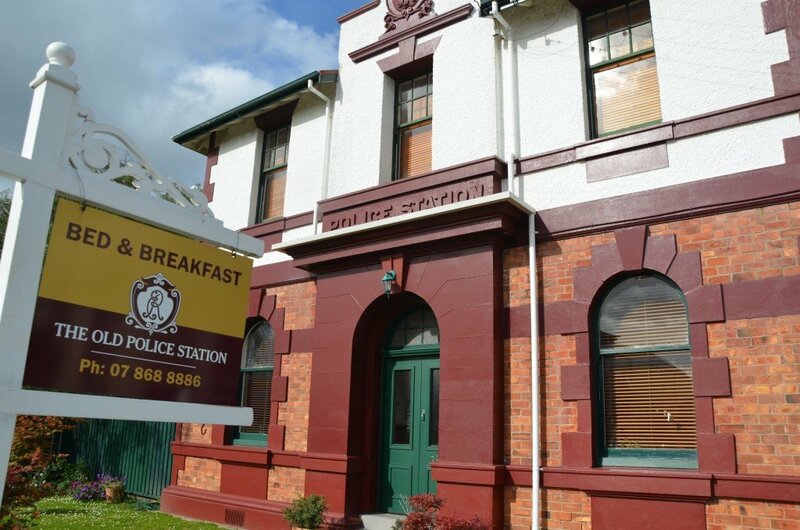 Built in 1909, the police station was sold and became a private home in 1991. The current owners bought it in 2010. We started the next day by driving up the western side of the peninsula, a coastal road with great views out into the ocean. This side has fishing rather than the sandy beaches and turquoise waters that you’ll see on the east side. 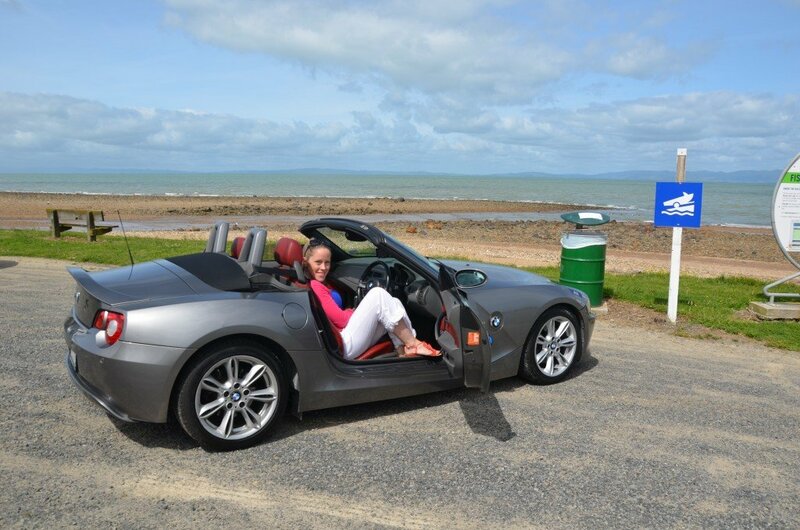 We enjoyed our little drive up the coast with the top down and the wind through our hair. In Coromandel Town, we stopped off for a coffee and a bagel (lots of bagels on this trip) at the Chai Tea House. We could have relaxed there for a while but we received a recommendation from the information centre to take road 309 across to the other side of the peninsula. Road 309 is a gravel road through the forest, along which there are various activities. You can hike to the Kauri Grove, where you can see some of these huge trees – they can grow to be more than 50 metres tall. If you have kids with you, then the Waterworks looks like a good stop, an interactive theme park constructed with recycled materials; or why not visit Stu’s wild pigs (we did see one pig run across the road – behind us, luckily, not in front of the car). 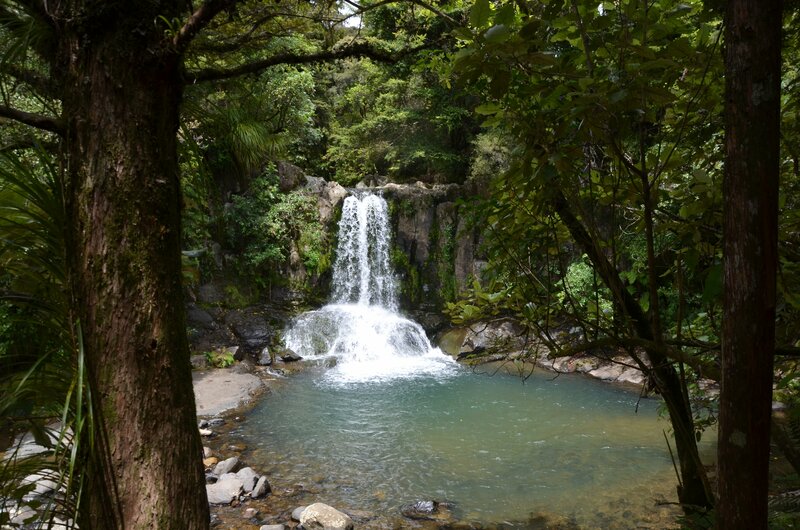 Our chosen stop on road 309 was at the Waiau Waterfall, where you can follow various trails or, as we did, simply walk to the waterfall, just down from where you park the car. 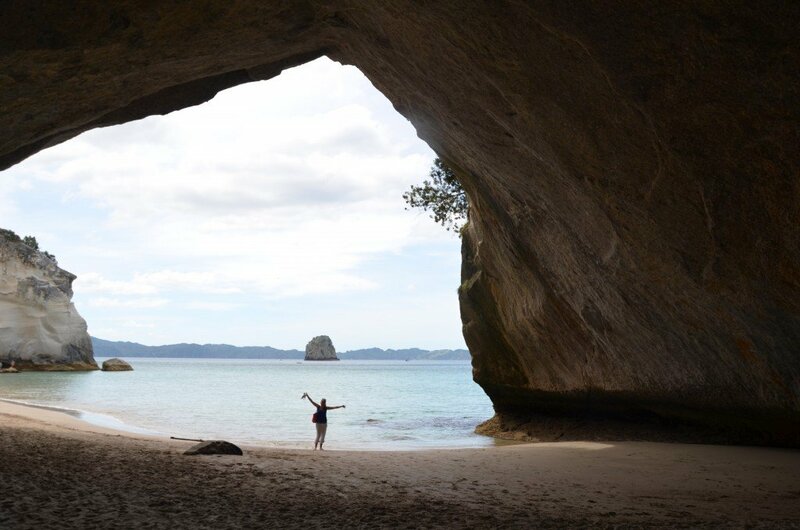 Since it was still early afternoon, we decided to take a little detour down to Cathedral Cove. This is on area of a marine reserve that can only be reached on foot or by boat or kayak, so we parked our car at the top of the cliff and walked down to the cove. 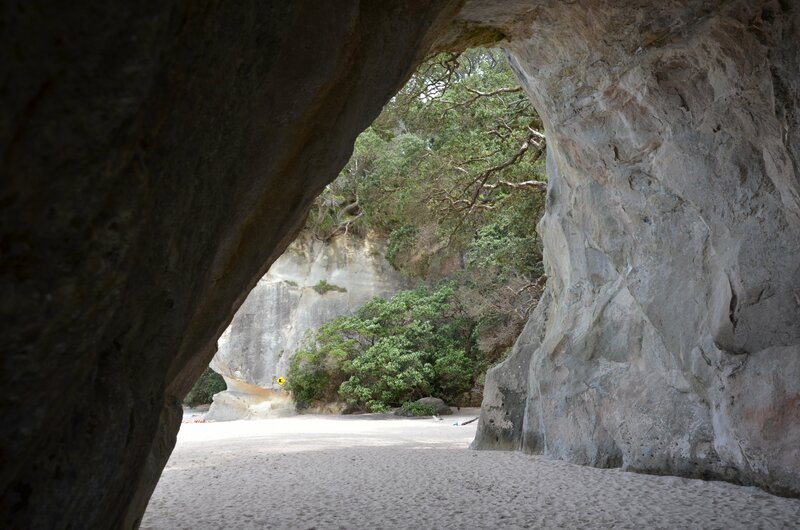 The naturally formed arched cavern of Cathedral Cove separates two sandy beaches. Bring your swimsuit if the weather is good as it’s a lovely little spot, even just to sunbathe if you don’t fancy a refreshing dip. You may recognise this other angle from the second Narnia film, where the Pevensie children return to the magical land to help Prince Caspian, having been transported from the London underground tunnel. Lucky them! The ruins of Cair Paravel sat up above, overlooking the beach. The east coast is where you’ll find all the beautiful beaches, including Hot Water Beach where you can dig for hot springs during low tide. There is also The Lost Spring day spa in Whitianga where you can relax in geo-thermal pools and get various treatments. Auckland Botanic Gardens: The Gardens are open all year round and entry is free. Old Police Station, Thames: You can stay in the main house or in the cells where you have two rooms and a kitchenette. Breakfast is included and there is space to park your car out in front; wifi signal was weak and unreliable but it’s a fun place to stay and a good place to base yourself when exploring the area. Having seen both sides, though, I would recommend staying on the east coast, although I can imagine it gets busy during peak summer season with both locals and tourists flocking to the beaches. 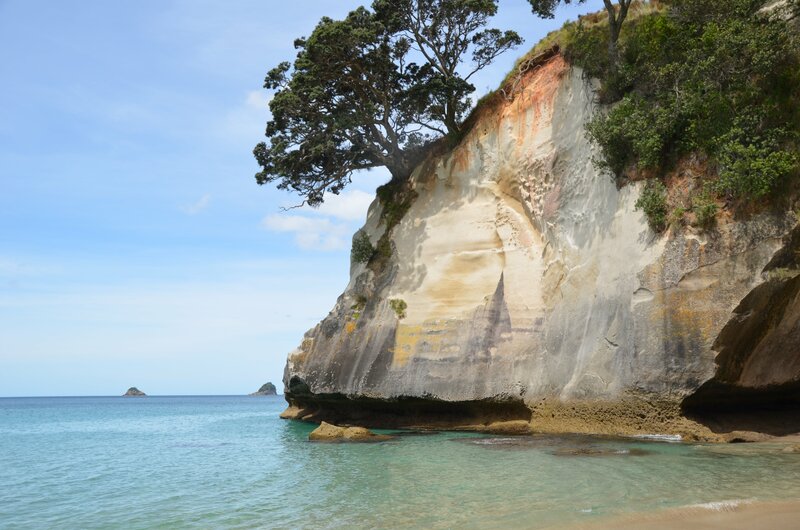 Cathedral Cove: You can hop on the glass-bottom boat or get in a kayak at Hahei Beach, or walk down from the car park as we did; it takes 30-45 minutes one way. Note that there are toilet huts up by the car park, but no shops or cafés; the car park was also completely full when we arrived, we were lucky to get a spot – though people are leaving all the time so with a bit of patience you should be fine. New Zealand is almost exactly as far away from the UK as you can possibly get: it’s almost a two-day journey with a 13-hour time difference. Somehow, though, I arrived having slept surprisingly well on the plane(s), and proceeded to sleep for 10 hours each of the first three nights in Auckland. Jet lag? What jet lag?! 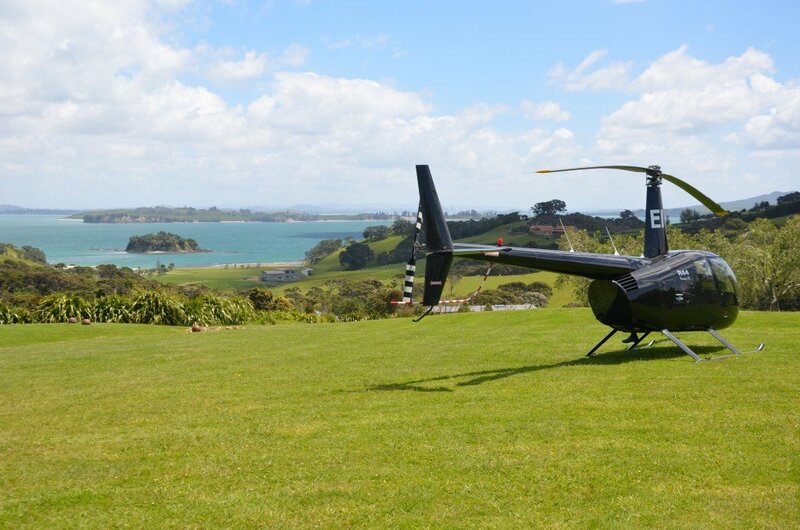 The cure for jet lag, we’ve been told, is to be found in Waiheke. My friend Annie and I did not know this, however, when we decided to take the ferry across to this island – New Zealand’s third most populated island after the North and South Islands – on our first day. I had heard about Waiheke from a Kiwi traveller sitting next to me on a plane a few months ago. He was chatty about his plans in Europe and when I told him I would be going to New Zealand he gave me some tips, including this island just outside of Auckland. The fact that Waiheke is “the ultimate cure for jet lag” (according to a 2009 article in The Sunday Times) we discovered only on the last stop of our wine-tasting tour. At Jurassic Ridge, we had a tasting of six wines from white through to red – my favourite probably being the Sauvignon Blanc, though the Cabernet Franc was lovely and Annie bought a bottle of rosé. Here, the grapes are grown, and wines produced, sustainably, and there are no chemical residues or additives like egg white or pork gelatine that is apparently used by some less reputable vineyards. Jurassic Ridge is owned and run by Lance Blumhardt, a former neurologist who took an early retirement from working in the UK to return to his home country and run this vineyard as a “hobby”, bringing a scientific approach to the art of wine growing and making that has since won him a long list of accolades for his product. Our previous stop had been Mudbrick Vineyard & Restaurant, where we had chosen the white wine sampling menu. It seems that white wines are more difficult to grow on Waiheke, so all but two of the wines we tried were from other districts such as Marlborough. 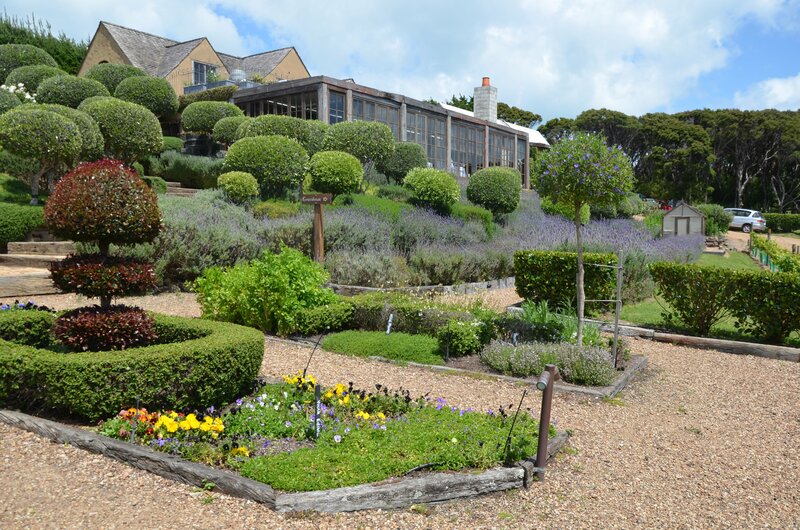 Mudbrick looked like a traditional English manor house with a lush garden and views over the vineyard. We had lunch with a glass of wine at Cable Bay Vineyards. A rather elegant establishment – as we ate, a couple arrived for lunch by helicopter – with stunning views. All three vineyards were beautifully situated with panoramas across the open landscape of the island and the ocean beyond. 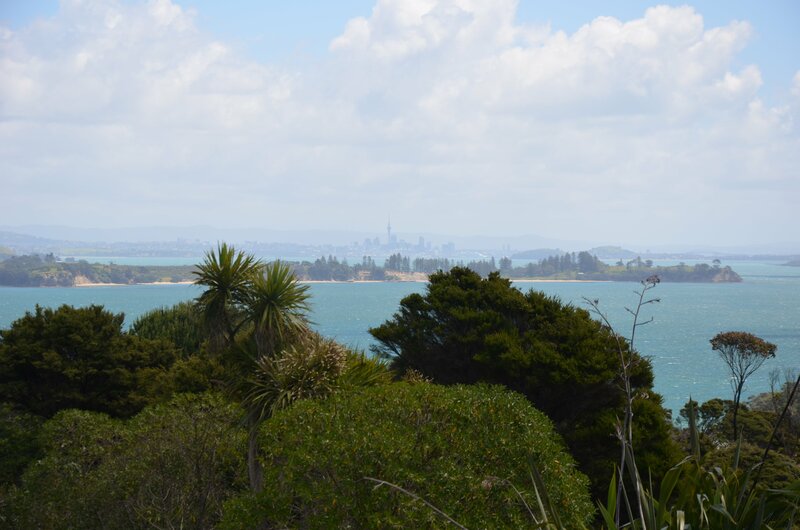 The skyline of Auckland, recognisable for its Sky Tower, can be glimpsed off in the distance. Being free spirits, we did all this independently, buying just the ferry ticket and then walking around the various vineyards that lay on the west side of the island. At one point, we veered off onto a path that took us in the completely wrong direction, ending up in a field with horses (better than bulls) – but that’s part of the adventure, isn’t it! If we had had more time, and with even sunnier weather, the island would have been well worth a longer visit with an overnight stay and some time on the beach. Instead, we made our way back on the evening ferry and had dinner in Auckland. We had dinner at the Federal Delicatessen, where I can highly recommend that you share 3-way pie combo. 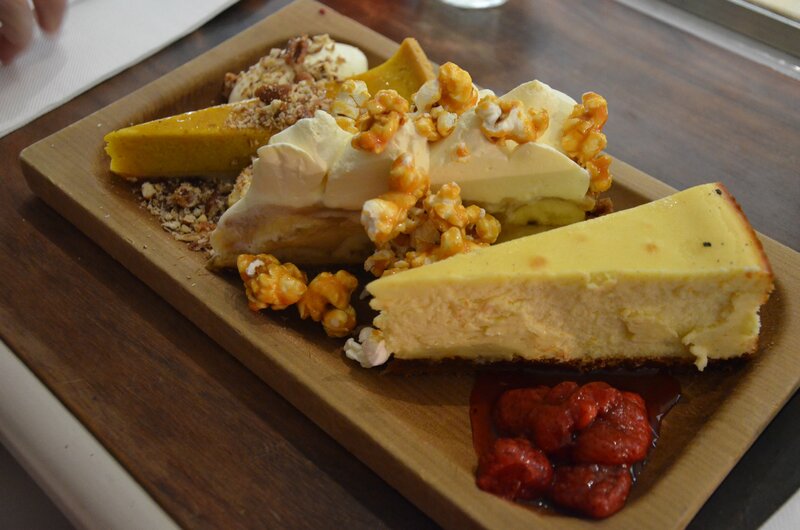 My favourite was the cheesecake, followed by the banoffee pie (with caramel popcorn on top!). 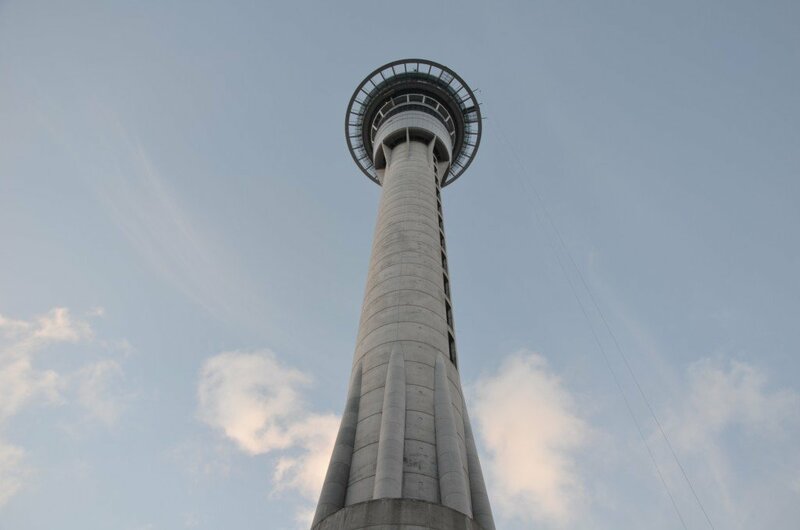 The city itself mainly offered the usual adventurous activities that you would expect in New Zealand – bungee jumping off the bridge as well as the SkyWalk and SkyJump at the Sky Tower, and various water sports. We spent our second morning at Auckland Museum, a funny place in its bringing together what would usually be seen in a separate Natural History Museum, War Museum, Ethnographic Museum… So we went from Maori boats and buildings to volcanoes to sharks to dinosaurs to WWI and WWII. A lot to take in, with a hugely diverse view of New Zealand and its history, including little known facts about the part it played in the wars as well as the relationship with Samoa and its people. 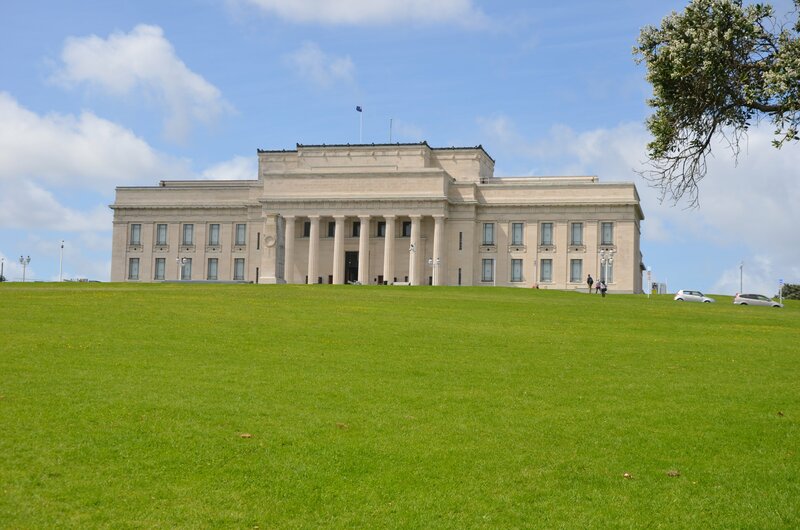 Auckland Museum is also a War Memorial, built with donations from Aucklanders in remembrance of their war dead. Next year, 25th April 2015 marks the 100th anniversary of the New Zealand and Australian (ANZAC) landings at Gallipoli, in which thousands of lives were lost against its Turkish defenders. We don’t learn about New Zealand at school, and so even this brief introduction to different aspects of its history was incredibly informative. Some quick facts for you: The islands were settled by Polynesians in the 13th century; the first Europeans to have reached them were Dutch Explorer Abel Tasman and his crew in 1642; and the country was colonised by the British in 1840 via the Treaty of Waitangi. Auckland is the biggest city with a population of 1.4 million of a total of 4.5 million, followed by Wellington and Christchurch each with under 400,000. 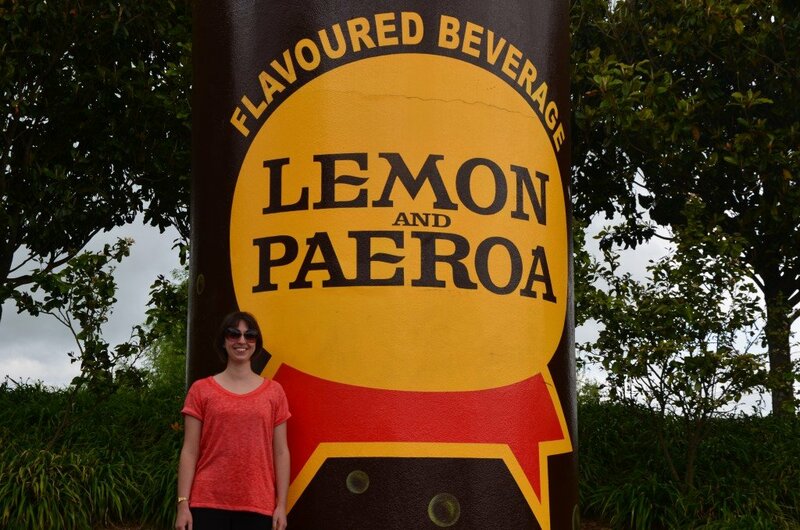 After English and Maori, Samoan is the third most spoken language. The two islands straddle the Pacific and Indo-Australian plates, which leads to volcanic activity as well as earthquakes, notably in Christchurch on the South Island in 2011 when 185 people died and the city was destroyed, now to be completely rebuilt. I flew Qantas from LHR to Dubai to Sydney to Auckland (the last leg operated by Emirates). I left at 9pm on Sunday to arrive 2pm on Tuesday – so a journey of 28 hours if you disregard the time difference. We stayed at Harbour Oaks Residences – great location and especially good if you’re staying a bit longer, as they are actually serviced apartments with living rooms and kitchenettes. And I got to do my laundry already after my long flight! Waiheke: We bought a return ferry ticket at $36 (you can also get one that includes a bus pass for getting around the island). 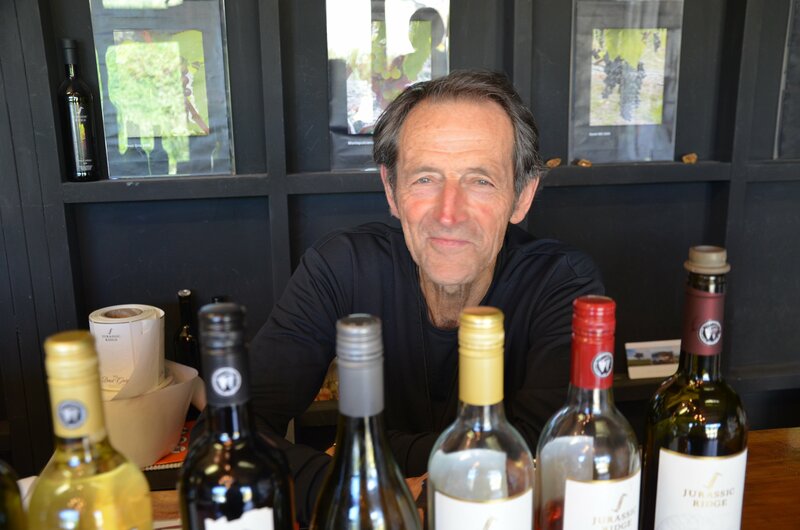 Wine tasting at Mudbricks and Jurassic Ridge cost $10 per person. 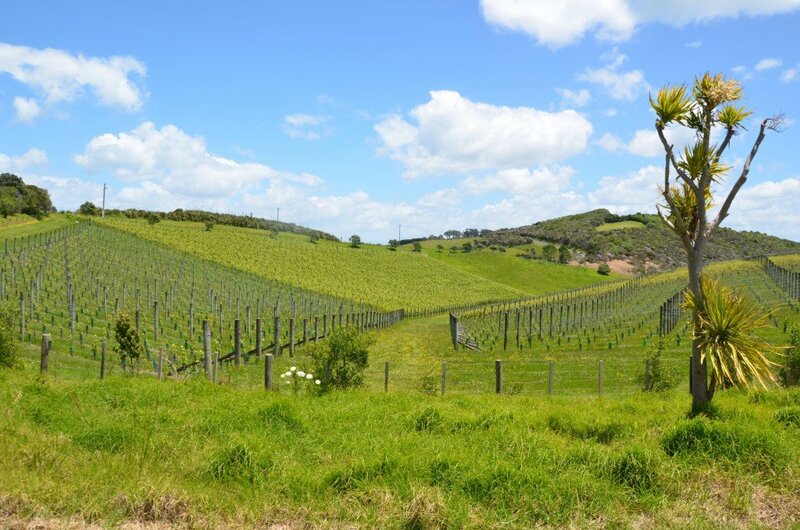 Alternatively you can do the Wine on Waiheke tour for $125 if you’re particularly interested in learning more about the vineyards or the Taste of Waiheke for $135 to sample both wine and olive oil. These tours include the ferry, an organised bus ride and a tour of several vineyards and/or olive groves, as well as lunch.